Chiang Mai is a city in mountainous northern Thailand. Founded in 1296, it was capital of the independent Lanna Kingdom until 1558. Its Old City area still retains vestiges of walls and moats from its history as a cultural and religious center. It&apos;s also home to hundreds of elaborate Buddhist temples, including 14th-century Wat Phra Singh and 15th-century Wat Chedi Luang, adorned with carved serpents. This is a blissfully calm and laid-back place to relax and recharge your batteries. Participate in a vast array of activities on offer, or just stroll around the backstreets, and discover a city that is still firmly Thai in its atmosphere and attitude. A sprawling modern city has grown up around ancient Chiang Mai, ringed by a tangle of superhighways. Despite this, the historic center of Chiang Mai still feels overwhelmingly residential, more like a quiet country town than a busy capital. 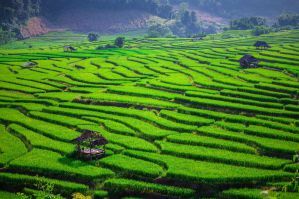 If you drive in a straight line in any direction, you’ll soon find yourself in the lush green countryside and pristine rainforests dotted with churning waterfalls, serene wat and peaceful country villages – as well as a host of markets and elephant sanctuaries. There&apos;s plenty to see and do in the charming city of Chiang Mai, and these hostels with swimming pools or hot tubs provide an excellent base for exploring the area. Brick House Hostel is ideally located in the heart of Chiang Mai nearby popular locations, such as Warorot Market, Thapae Gate, Sunday Walking Street, and the Flower Market. With a stay at Brick House Hostel, you will be minutes away from many beautiful temples, various restaurants, and a selection of stores in the city. The hostel is set in a nice, quiet neighborhood, but it is only a 5 minutes&apos; walk to ‘Night Bazaar’ – a shoppers paradise, one of Asia’s most fascinating markets. There are 5 ensuite rooms available with attached bathrooms, TV, desk and open wardrobe. Beds are Queen-size with pocket-spring mattresses. These rooms have flat-screen televisions, are spacious, air-conditioned and spotlessly clean. The dormitory rooms have 4, 6, 8, 10 and 12 (bunk) beds. The single sized beds are also equipped with pocket spring mattresses. All beds have a duvet and a towel will be issued at check in. These rooms are spacious, air-conditioned, and spotlessly tidy. In addition, Brick House provides an added feature of sizable lockable storage, each having a power outlet inside the locker for every guest. The International Airport, Railway Station, and Bus Station are all within 15 minutes by Taxi or Tuk Tuk. You will not find another property like this in Chiang Mai. With magnificent rooms and facilities, you can relax or party in style. The property provides a fitness center, a common area, outdoor terrace, and swimming pool available for guest&apos;s use. There is also a bar and restaurant on site for convenience. Wi-Fi, parking, and linens are also included with your stay. Glur Chiang Mai Hostel features 23 rooms, all well-equipped and elegantly decorated, and complimented by a spa. Guestrooms are separated into different themes. 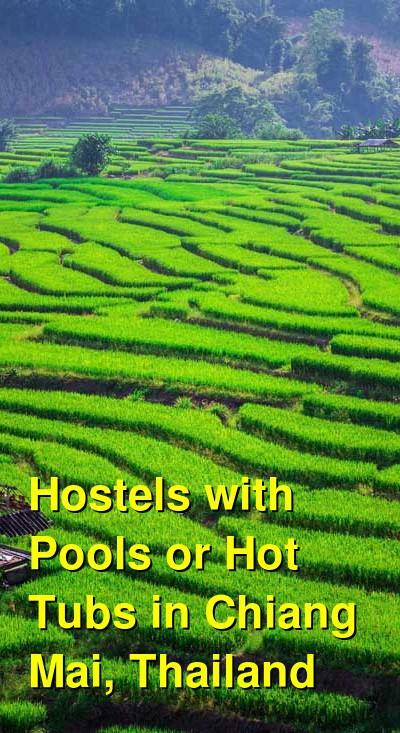 Hostel features include a restaurant and a spa. Glur Chiang Mai Hostel is located in close proximity to the night bazaar, Ping River, and many temples. Enclosed between the Nawarat Bridge and Iron Bridge on the banks of the River Ping, Glur Chiang Mai Hostel is a perfect place to discover the city. The property offers a restaurant, an outdoor swimming pool, and rooms with a TV. Free Wi-Fi is available in the public areas. Glur Chiangmai provides free parking, and is a 25-minute drive from Chiang Mai International Airport. Featuring high ceilings and bright wall colors, rooms at the hotel come with modern decor. All come with an en suite bathroom equipped with shower facilities. Staff at the 24-hour front desk can arrange for laundry and room service. The restaurant serves breakfast on the terrace, offering a fine selection of Western and Asian dishes. Linens and towels are included with your stay. Deejai Backpackers is a large and lively guesthouse with a vibrant social scene located in a quiet part of Chiang Mai’s old city, only 15 minutes&apos; walk from Thapae Gate and the main tourist bars. There is a garden complex just 2 minutes&apos; walk from the hostel complete with a bar, restaurant, pool table and salt water pool. The garden is open to all backpackers in Chiang Mai and the pool is free for our guests to use. Air conditioning and ceiling fans are available and there is a common room to relax and get to know others. The dorm rooms are 4 bed ensuites, and the property also offers a range of private rooms to suite to needs of most travelers. Their friendly Thai and English speaking staff are more than happy to assist you with any information and or travel arrangements you may need. Wi-fi and linens are included with your stay and towels are available for hire. Eco Resort Chiang Mai offers value accommodations for the nature lovers with bright, clean, comfortable, and well-serviced rooms set within a large and beautiful shaded garden. A range of options are available to suit all budgets for lone travelers or for friends touring Thailand together. Located close to the center of Chiang Mai, guests will enjoy easy access to all that the city has to offer. A place where guests can have a wonderful start to the day in the lush tropical garden, or spend a lazy afternoon beside the large swimming pool. Eco Resort Chiang Mai is conveniently located on Bumrungraj Road, close to the Chiang Mai Bus Station and Railway Station only a 5 minute drives or 15 minute walk. So, guests have quick and easy access to Chiang Mai’s wonderful culture sites, fabulous shopping, restaurants, and vibrant nightlife. The renowned Chiang Mai Night Bazaar is just a short drive away. Chiang Mai International Airport is a 20-minute drive from the hotel. Air conditioning is available at the property and Wi-Fi, parking, linens and towels are all free with your stay.